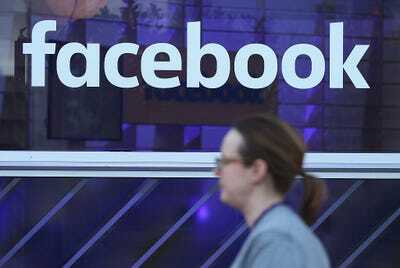 Sean Gallup/Getty ImagesYou can make your Friends list private in a few quick steps. It’s possible to hide your Friends list from specific people as well, leaving the list visible to all of your other friends. Facebook’s currency is you – you and all of your personal information. That’s one reason Facebook likes to keep most information about you public. 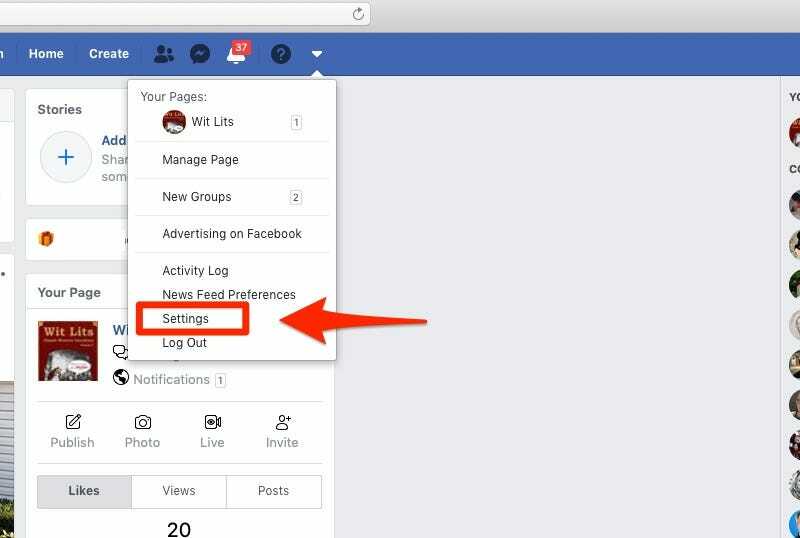 By default, your profile information, posts, and even your friends are available for all to see. 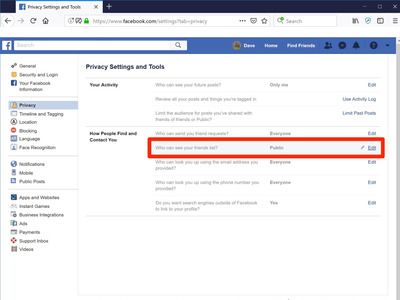 In practice, it’s often convenient for your friends list to be public, because it can help people to find and connect with you, by verifying friends they also know. 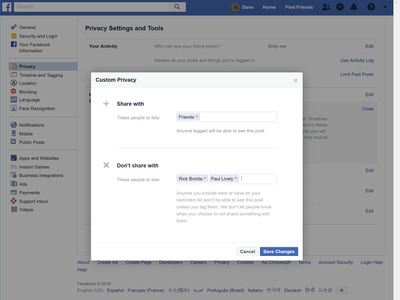 If you prefer, you can restrict who can see your entire Friends list using Facebook’s privacy settings. You might not want everyone to see it, especially if you want to mask the identity of some friends from others. Or perhaps you just value your privacy and don’t want everyone to know who you’re connected to online. Dave Johnson/Business InsiderSpecify who can see your Friends list in the Privacy menu. 6. Choose who you want to be able to see your friends list – you can choose from options including Friends and Just Me (which hides it from everyone). If you click “Custom,” you can choose to enter specific names. For example, you can share your friends list with all of your friends except for Bob Smith. 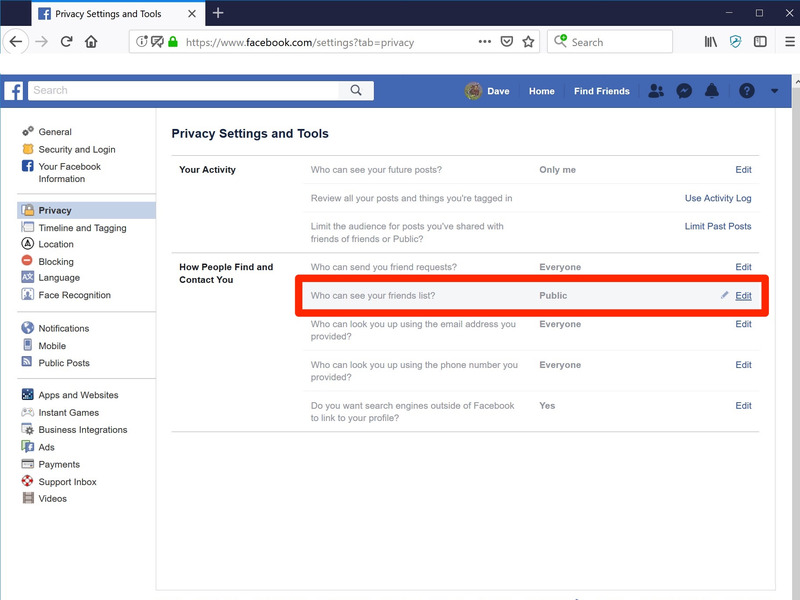 Dave Johnson/Business InsiderYou can hide your Friends list from specific people in the Custom Privacy menu. 2. Tap the three horizontal lines (this is the hamburger menu). On the iPhone, this is in the lower right of the screen; on Android, it’s in the upper right. 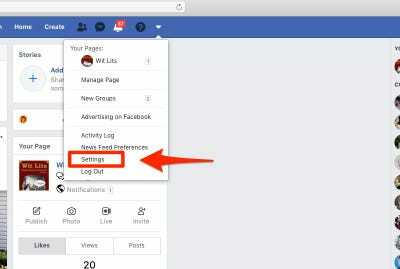 Dave Johnson/Business InsiderExpand the Settings & Privacy section to see the Settings menu. 7. Choose who you want to be able to see your friends list. You can choose to restrict the list to friends or just to “Only Me” (which hides it from everyone else). If you choose “Friends except…” you can block specific people from seeing your friends list. Dave Johnson/Business InsiderIf you expand the list of options, you have a lot of choices for customising who can see your friends list. Of course, you can simply choose “Only me” which hides it from everyone.